NASA Earth Observatory image by Lauren Dauphin, using VIIRS data from the Suomi National Polar-orbiting Partnership. Caption by Kasha Patel. 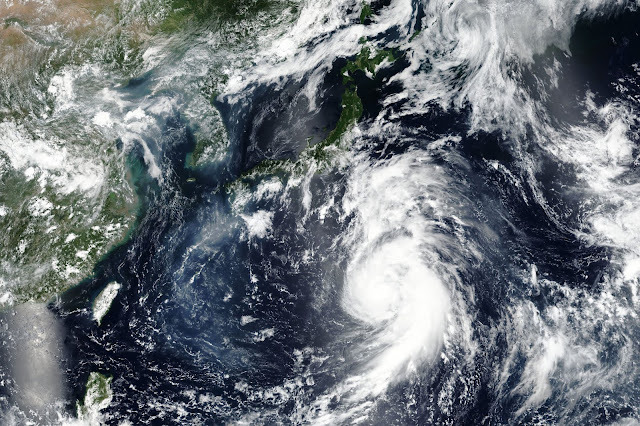 A powerful typhoon is heading for Japan after one of the countries deadliest months ever after more than 300 people died and nearly 40,000 hospitalised from floods and a crippling heatwave. Authorities have issued evacuation orders to western areas still devastated by floods and landslides. According to AFP.com, the storm, currently some 250 kilometres south of Tokyo, is expected to barrel towards the western Chugoku region Sunday, where record rainfall earlier this month unleashed flooding and landslides, killing around 220 people and leaving more than 4,000 survivors still living in temporary shelters.